It is recognised at Scots College that the key to success, both within school and out, is for students to have a passion for subjects, values and interests that ultimately lead to a satisfying career where students reach their full potential. Career education with the availability of on-line psychometric questionnaires, and advice provided in the Senior School helps give students the necessary information, tools and confidence to face a succession of options, decisions and career choices. 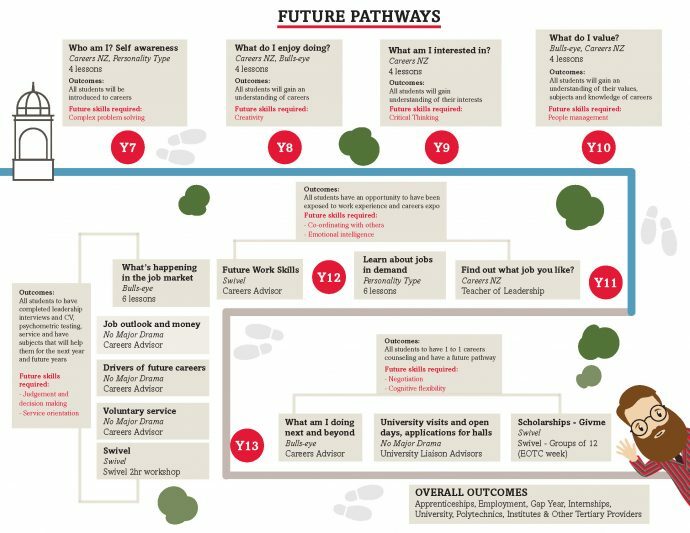 Career education is delivered through the College’s Future Pathways Programme. It is incorporated for all students Year 7 to 13 through the pastoral care tutorials run through the House system. There is also a well-resourced careers room highlighting a variety of tertiary institutions and industry training establishments.